The tally of Jupiter’s moons reaches 79 but astronomers found something strange about the motion of one of them. Our solar system is surrounded by an assortment of planets, each having a diverse set of properties and characteristics than the other. The solar system is believed to be formed about 4.6 billion years ago as a reaction of gravitational collapse of a giant interstellar molecular cloud. The surprising part of our solar system is that the majority of its mass is covered by the sun. Meanwhile, the planets take the runner-up position as far as the system’s mass is concerned. The planets are categorized by their diverse characteristics. The terrestrial planets, Mercury, Venus, Earth, and Mars are majorly formed by rock and metal. These planets are positioned in the inner part of the solar system. Next up, Jupiter and Saturn being the largest planets do justice to their name Gas Giants. These two planets are formed with the combination of two gases, hydrogen, and helium. Lastly, Uranus and Neptune being the furthest from the sun have an extreme icy temperature, thus the title of the ice giants is given. Substances that have much higher melting points than helium and hydrogen form these planets. Apart from the sun taking the majority of the solar system’s space, Jupiter has an extensive amount of mass as compared to its fellow planets. 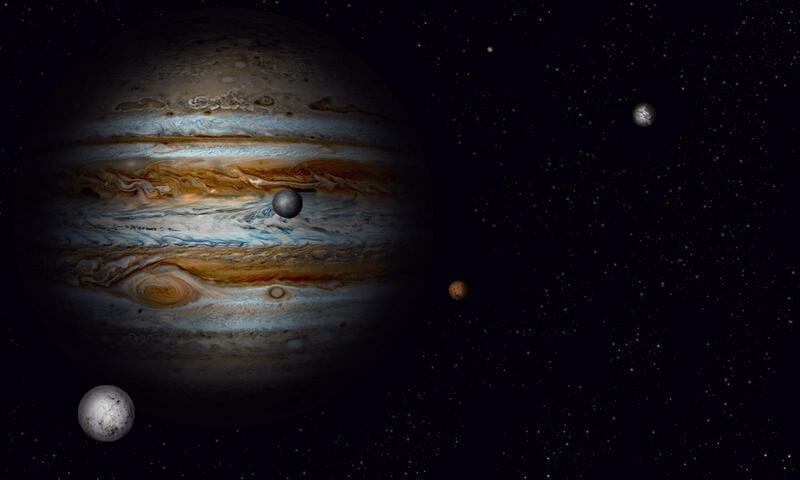 If you were to combine all the masses of every planet present, Jupiter would still be twice the size of that sum combined. Jupiter has stripes and swirls running around it which are relatively cold. A windy cloud of water and ammonia float around in the atmosphere. A giant red spot which is Jupiter’s statement is in actuality a storm bigger than the earth that has raged for hundreds of years. Another fascinating thing about this giant is that it has an extensive amount of moons. In 1610, Galileo Galilei discovered the first four moons of Jupiter. Surprisingly, these moons were not only the first moons but also the most massive moons of the planet. These were named Galilean Satellites, which contained Lo, Europa, Ganymede, and Callisto. These moons had several rings around them, which were faint as they were formed of dust. Over the centuries, many moons around this planet were discovered. They all had diverse sizes, compositions, and distances but none stood out as much as Galilean Satellites. Recently, 12 new moons around Jupiter were discovered. With these new entrants, the moon count of the Jupiter goes up to 79. 35 of them are confirmed and named while 26 of them are waiting in line to get official confirmation of the discovery. Scientists were in the search of the ninth planet to fill the void that Pluto left when they stumbled upon this sighting. These respective moons were considered “normal” with the exception of one odd moon. Nine of the discovered moons had Retrograde Orbits. This term suggests that the orbit it spins around is in the contradictory direction to its planet’s orbit. In such a scenario, it takes many years for the moon to complete a single cycle around its respective planet. Currently, about 33 of the outermost moons are following this conflicting cycle. Moving on to the two newly discovered moons, which have a different rotation than the one stated above, they follow a relatively plausible rotation called Prograde Orbit. This means they follow the flow in which Jupiter moves. Orbiting in the same direction it takes less than a year to complete its orbit. Lastly, the odd one out of these moons follow a prograde orbit but it is far away from its fellow prograde moons. This “Oddball” moon is known as Valetudo. The peculiar thing about this moon that caught scientist’s eye was its size. While all the other moons ranged from hundreds to thousands of kilometers, Valetudo is less than a kilometer in diameter. Its size and the fact that it is further away from Jupiter enables it to complete its orbit in around one and a half year. Categorically, the entire prograde moons orbit close to Jupiter and retrograde moons circulate farther from Jupiter. Another strange thing that was observed about this oddball was that it was moving further from Jupiter making it to revolve near the retrograde moons. This would endanger Valetudo in the long run and it is believed that it will explode. Terribly written, clearly just trying to pad this article out with reiteration and repetition.